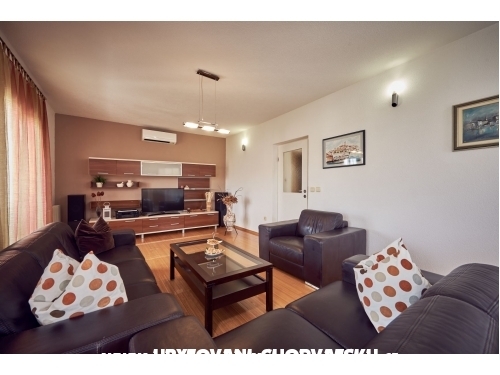 Apartments Tonka are situated in Okrug Gornji on Ciovo 3,5 km far from town Trogir. Ciovo is an island connected by bridge with mainland. To Trogir you can go by car, bus or boat. Split, second largest town in Croatia is situated just 25 km far from Trogir. 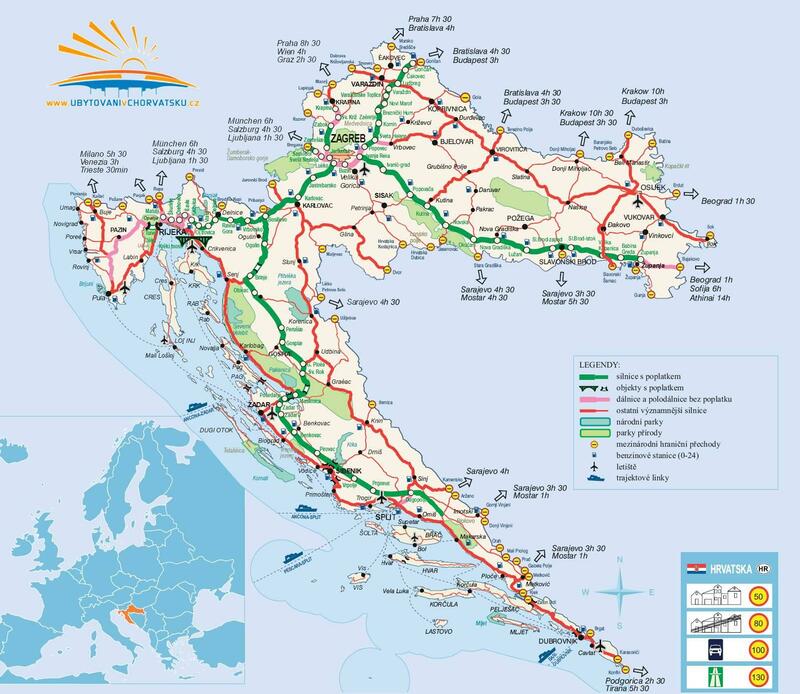 To Split you can also go by car, bus or by boat. 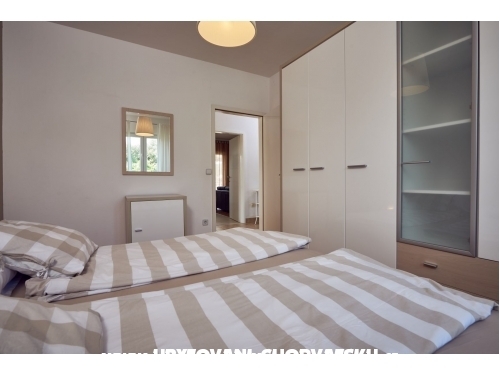 Apartments are situated on quite and very lovely place away from high traffic. 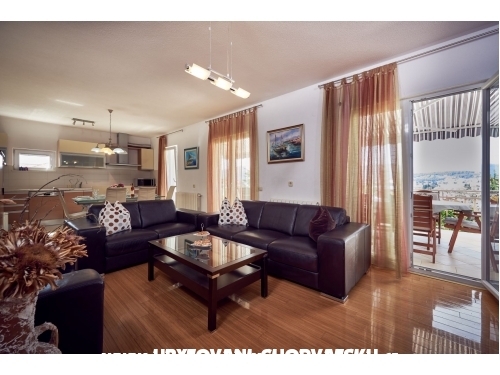 LUXURY APARTMENT A6+0 has total area of 100 m2 + 30 m2 balcony with sea view and large garden with flowers, vegetables and mediterranean herbs in front of the house. 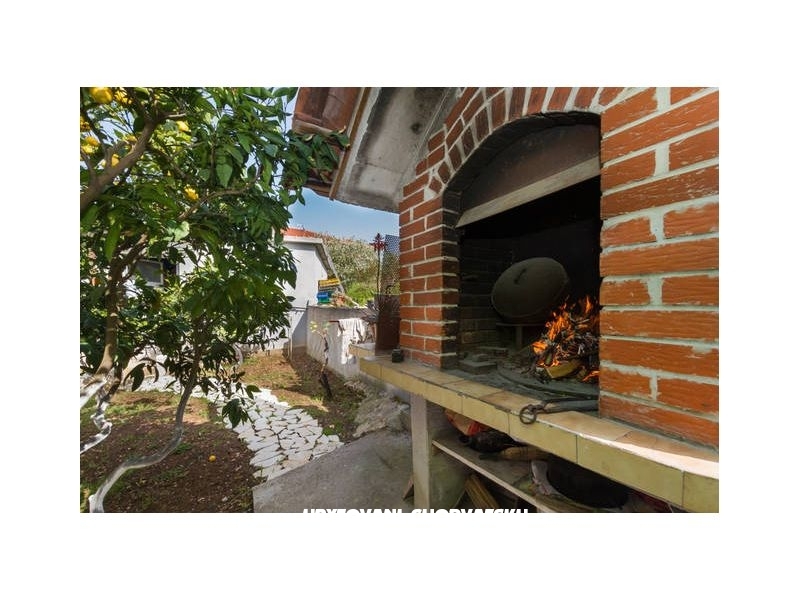 And also there is a barbecue in one part of the garden you can use. Area is very suitable for the children since there is no traffic and it is very large space for play. We also have baby beds we can put in one of the bedrooms free of charge of course. 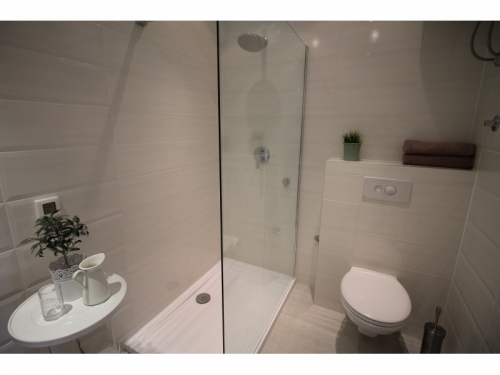 Apartment is fully equipped, it consists of: 3 bedrooms with double bed 1 toilette with shower. 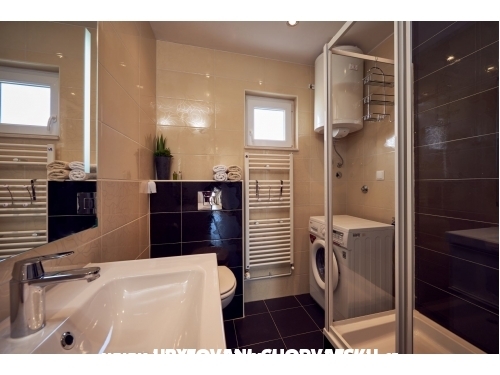 And there is also outside shower with hot water you can use when you come from the beach. Large new kitchen with dish washer, coffee maker, oven, toaster, microwave, refrigerator, freezer. There is everything you need for cooking in kitchen. 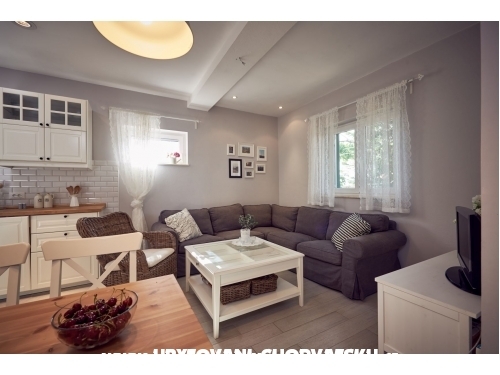 Large dining room and large living room with sitting area. In living room there is TV SAT with more than 200 channels. On the balcony there are table and chairs, also deck chairs, swing and everything necessary for relaxing. Since you are on top floor you have all privacy on balcony and fabulous sea view where you can enjoy. There is air condition which is placed in living room so you can use it to cool whole apartment with bedrooms. Internet access free of charge ( wi fi ADSL - fast internet). 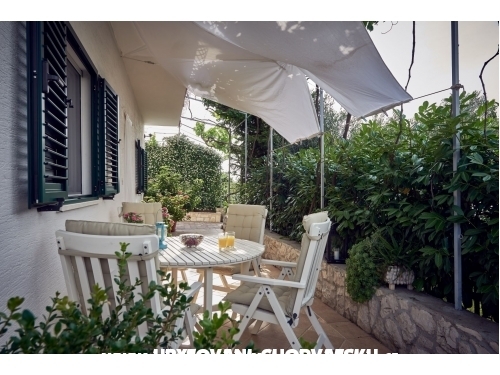 COMFORTABLE APARTMENT A4+1 has total area of 60 m2 + 25m2 terrace with partial sea view and large garden with flowers, vegetables and mediterranean herbs in front of the house. And also there is a barbecue in one part of the garden you can use. Area is very suitable for the children since there is no traffic and it is very large space for play. 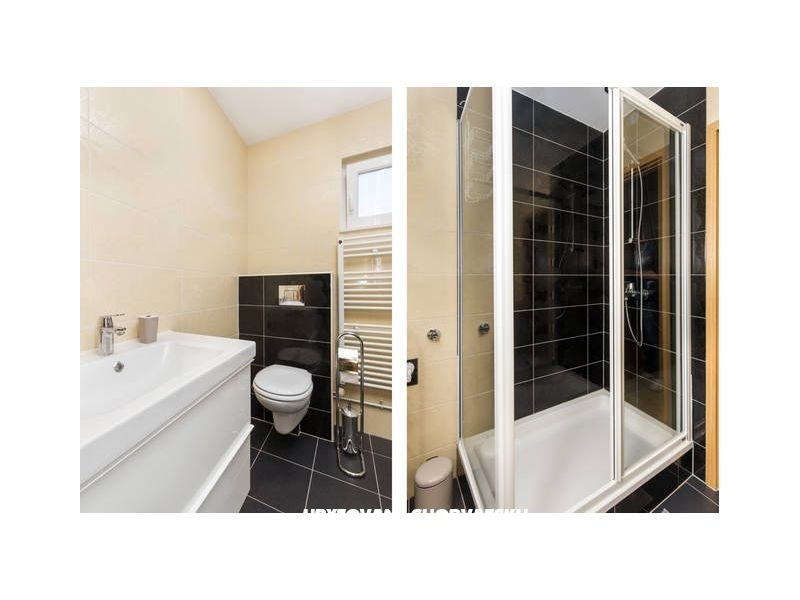 Apartment is fully equipped, it consists of: 1 bedroom with double bed 1 bedroom with double bed and one bed for one person 1 toilette with bathtub. And there is also outside shower with hot water you can use when you come from the beach. 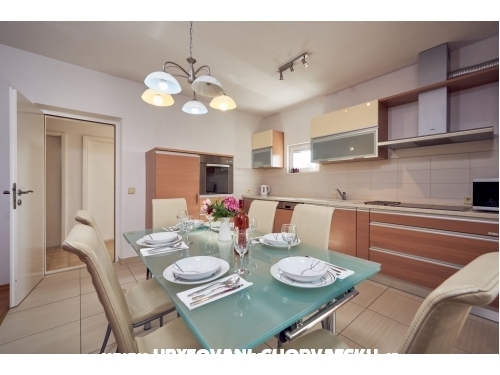 Large kitchen with coffee maker, oven, toaster, microwave, refrigerator, freezer. There is everything you need for cooking in kitchen. 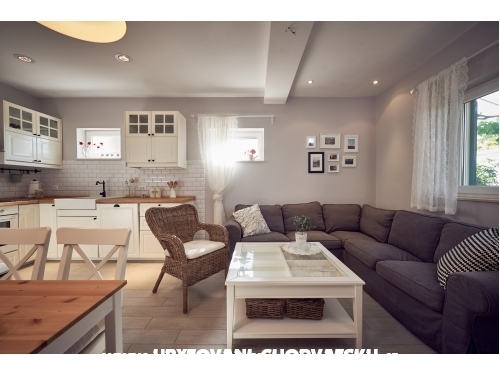 Dining room and living room with sitting area and one sofa bed. In living room there is TV SAT with more than 200 channels. On the terrace there are table and chairs, also deck chairs, and everything necessary for relaxing. You have all privacy on terrace and great sea view where you can enjoy. There is air condition which is placed in hall so you can use it to cool whole apartment with bedrooms. Internet access free of charge ( wi fi ADSL - fast internet). You also have large parking area in shade Washing machine You can use in agreement with owner. 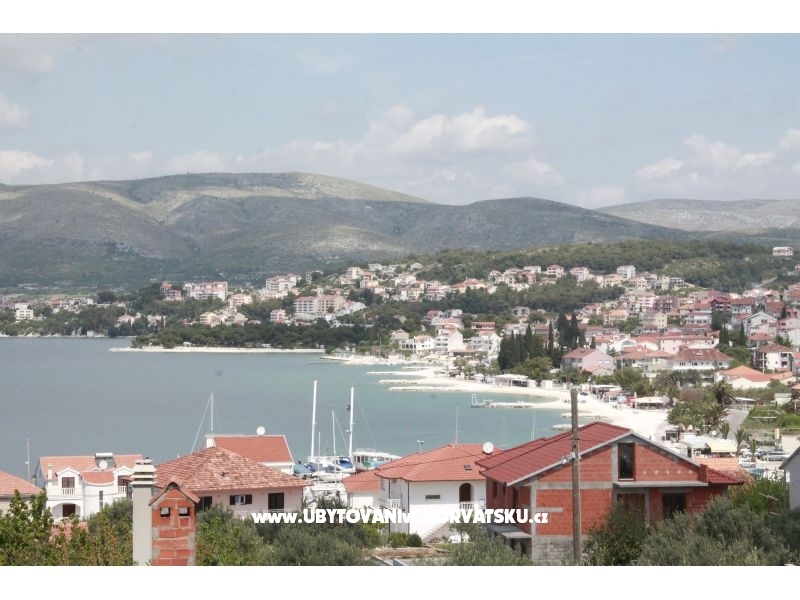 Center of Okrug Gornji is 200m far from the apartment with shops, fish market, open market, post, pharmacy, policlinic, restaurants... Sea and beach are 150m far from the apartment. Beach is with gravel and suitable for adults and children with shade. Ciovo is famous of large number of beaches so I am sure you will enjoy here.